The New Classic: Fresh and lively, America's best-selling unoaked Oregon Chardonnay is full of citrus, quince and melon flavors offering all of the delights of food-friendly, cool climate whites. OREGONICALLY GROWN®. 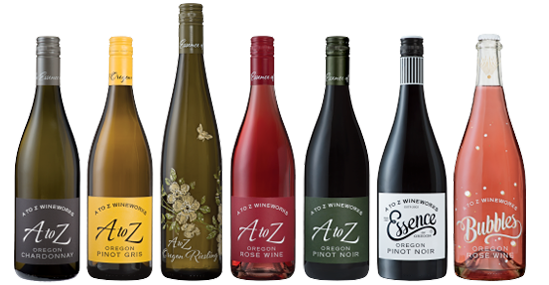 The 2017 A to Z Chardonnay radiates with a beautiful shine in the glass, then greets with notes of lemongrass,key lime, honey, pear and white peach. Deeper aromas of grapefruit, honeydew, pineapple and graham crackers come through. The broad palate is fresh with vibrant acidity exhibiting all the characteristics of a true cool climate wine with aromatics and flavors in perfect harmony. Modest in alcohol, the 2017 A to Z Chardonnay is a ridiculously food-friendly wine finishing round, rich and generous. Fresh, vibrant, and lively foods that sparkle with acidity like Baja fish tacos or heavier foods that need a bit of a high note lift such as roasted monkfish and trout. 1. In a small bowl, whisk together a teaspoon of Dijon mustard, 1/4 c of lemon juice, 1/4 c of orange juice, one cup of olive oil, and a dash of salt and pepper. Chill. 2. Steam bok choy over boiling water until bright green, around 4 minutes. 3. Dry and season scallops. In a very hot, medium sauté pan add the scallops and heat for 2 minutes. Flip the scallops, turn off the heat, and allow to cook for 1 more minute. Remove from pan and allow scallops to rest for 5 minutes before serving. *Next level: Add toasted sesame seeds to the bok choy and quickly sauté in a pat of butter just before serving.